It’s not always about the code, it’s about the kids, it’s about the learning. It is about moving young minds beyond pop culture vernacular to an expanding vocabulary. I want young minds that can solve problems through analytical thinking. I want Etymologist’s, specialists in understanding where things came from and where they are headed. I want young thinkers who know the who, what, where, when, and how of stuff. Thinkers that know the history of vocabulary and thinkers who can envision the future of language. Me: Did you just use the word ‘Awesome’. Student: No Mr., I would never use that word. I use ‘lit’. Me: With the use of ‘lit’ are you referring to the participle of light and all of it’s misinformed Urban Dictionary derivatives, or are you referring to the adjective that means ‘drunk’? Student: Mr., I don’t know, I just like the word. And that led to a seize the moment opportunity of research and replacement. Delving into the history of the word “awesome”, and looking for a suitable replacement that moved beyond the pop culture vernacular. 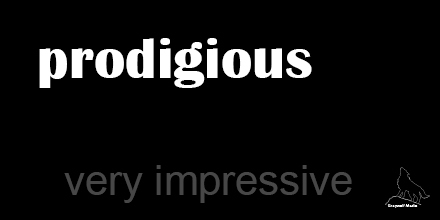 We chose, prodigious. A word that means amazing or wonderful: very impressive according to Webster online. We clicked and clicked on the sound icon familiarizing our selves with the phonetics. We repeated the word over and over and then began using it in sentences. Spontaneous student participation with no hint of manipulated student participation tactics or techniques. It was response born in the lab of creation without any prompting. Was this vocabulary day, no. Was this a planned lesson, no. Was this written in the lesson plan, no. Were we writing lines of code in a code editor, no. We were engaging in spontaneous problem solving. Using our minds and technical tools to move beyond the ordinary to the extra ordinary. This was the intersection of experience and opportunity. The place where more learning accidents need to take place. The place of coding etymology.